Silks of Bengal were much acclaimed the world over, since ancient times. 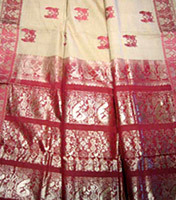 The best-known Bengal silk sari, which carries its legendary name, is the Baluchari saree - a product of exquisite design, and fabulous weaving technique. A revival in recent times of both the Baluchari and yet another outstanding, traditional Bengal Sari, the Daccai, has led to nationwide and worldwide popularity and renewal of interest in Bengal silks. Like silk, cotton saris are also woven in a fascinating and exquisite range. The Daccai Jamdani is a fabric on which the designs are raised in inimitable style. The Batik prints originating from Javanese wax designing, revived in Santiniketan. 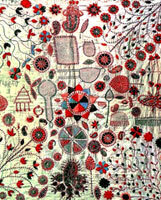 Floral forms circular kalka shapes, pyramidal and variations of geometric designs are typical. Handloom still remains the great employer in rural Bengal. Today hand-painted scrolls also silk-screened and printed are quite popular as wall hangings etc. Shantipur in Nadia; Begumpur, Rajbalhat and Dhanekhali in Hooghly; Kenjekura in Bankura; Fulia, Guptipara and Samudragarh in Nadia and Burdwan - are the homes of these legendary weavers. The Kantha of Bengal, is an all-purpose wrap, beautifully stitched together from pieces of garment for use as bedspreads (Sujni Kantha) mirror-wraps (Arsilata) and the like. Multiform designs fill every segment, pocket and compartment. They run along the borders, illuminating the edges. Except for the straight kantha stitch, it is customary to represent illustrations from well-known epics such as the Ramayana or Krishnalila, and also legends evolving from folk-rituals of Bengal (Vratas). The results are products of art-consciousness and creative aptitude in symbolic communication. Figures of complexly stitched and bespectacled with colour, the lotus as the central point in the kantha from which the design spreads - all are redolent with meaning. Most importantly, the kantha is a creation of the essential female - the mother, the wife, the sister and the loved one. It is her eye, her emotions, and her skill that gives us this exotic example of needlework and embroidery rolled into one. Old, undivided Bengal had an ancient textile tradition, rooted above all in the skilled weaving of delicate muslins and the folk embroidery of quilts. The fine malmals and jamdanis of Dacca, and the Baluchar brocade saris of Murshidabad with their pictorial borders, were prized products. The embroidered quilts, intricately worked with scenes inspired from the Portuguese (featuring, for example, armored men on horseback) in the wild silk native to Bengal and Assam, and exported to Europe in the seventeenth century were also very popular. These were textiles that sought to adapt themselves to the demands of a wide market, both in India and abroad. In the sphere of folk textiles the needle worked quilts of Bengal and Bihar form a group of some of the most interesting clothes of the subcontinent. They are known as kanthas in Bengal and as sujanis in Bihar. In the past they were made for family use or as gifts, out of cast-off saris or dhotis. Saris and dhotis in this area are predominantly white, sometimes with a border in black or red, or blue and red, sometimes with the addition of yellow or green. Three or four sections of the sari or dhoti were laid on top of each other and then quilted. The simple running stitch used in quilting produces an embroidery-like design whose details were filled in with satin and stem stitch. Threads were taken from the colored borders of the saris or dhotis for this purpose. The conventional pattern of Bengal kanthas had a lotus medallion in the centre (symbolizing the universe) and four buttis, or trees, at the corners. The rest of the field was then embroidered with all manners of motifs: birds, fish, animals and people, with domestic scenes mixed in with religious and allegorical figures. Very rarely were two kanthas ever alike. The distinguished textile scholar Stella Kramrisch believes the inspiration for these textiles lies in the alpana designs, which are drawn out on the floor and doorstep in Bengal at festival times. Kanthas were used as winter quilts, covers and wraps for books and valuables, and as mats for ceremonial purposes. Kantha-making for home consumption in Bengal died out by about the end of the first quarter of the twentieth century due to the usual pressures of industrialization (West Bengal was then the most industrialized state in India) and changes in rural life. The main centres for kantha-making were in East Bengal, now Bangladesh, where it has now been revived. 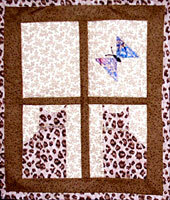 Here embroidered, quilted hangings are made with new cloth to some of the old designs, the best of them expressing some of the lively views of nature of the old classics. These new kanthas are aimed at the export and tourist market.